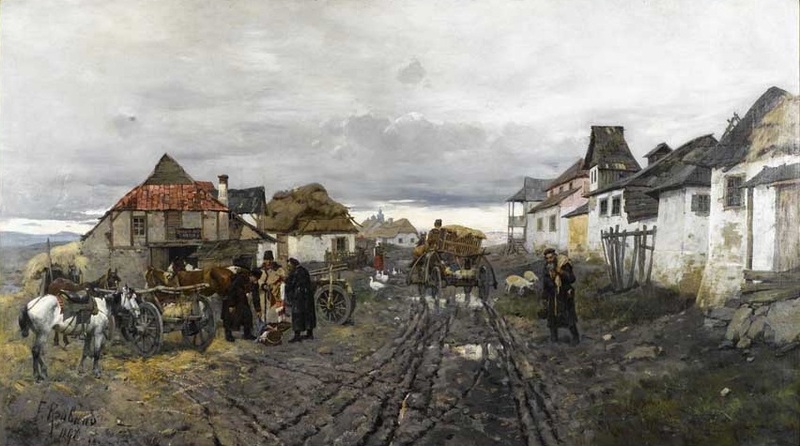 This painting, Village Merchants: Street of Jarmolinzi in Podolien, by Franz Roubaud, depicts a village scene in the Podolia region of Ukraine, which, along with other lands formerly part of the Polish-Lithuanian Commonwealth, became part of the Russian Empire in the late eighteenth century. The scene befits the title, showing townspeople peddling wares and conducting business transactions. 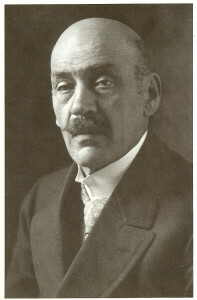 Nearly half of Podolia’s Jews were involved in commerce. 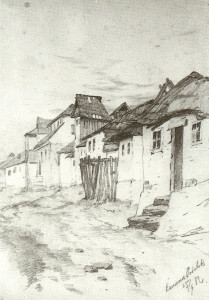 The village’s muddy street and modest buildings beneath a grey sky imply the hardships of everyday life. As viewers we are removed from the scene, observing from a distance, a perspective that matches the marginalization of Jews in Russian society. Jews were restricted to the periphery of the Russian Empire, in what was called the Pale of Settlement. It was initially created to impose commercial restrictions on Jews and generally to prevent integration with the rest of Russia’s population. Village Merchants stands apart from Roubaud’s oeuvre. In this brief break from the battlefield, Roubaud participates in a tradition of non-Jewish Russian artists depicting Jews in art. Starting in the nineteenth century, Russian artists became interested in Jewish life, illustrating their subjects under an ethnographic, as well as artistic, lens. 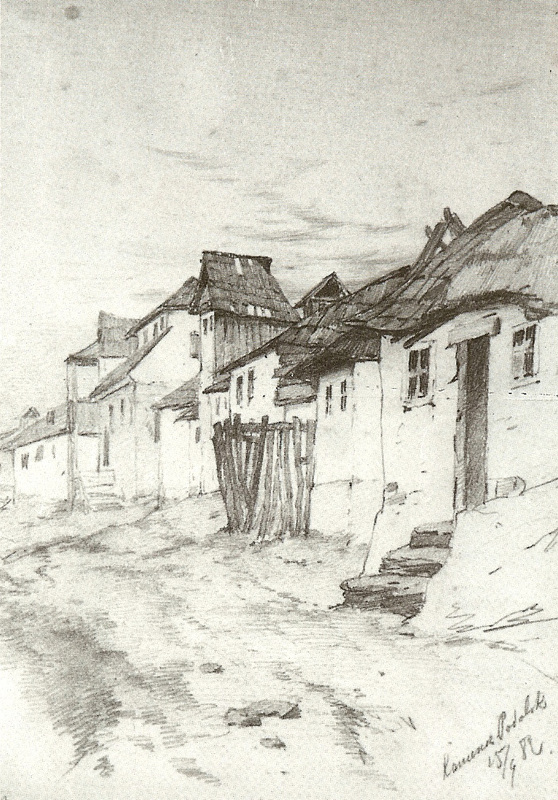 From the time of this sketch to the painting’s completion in 1897, Russia’s Jews experienced heightened persecution. 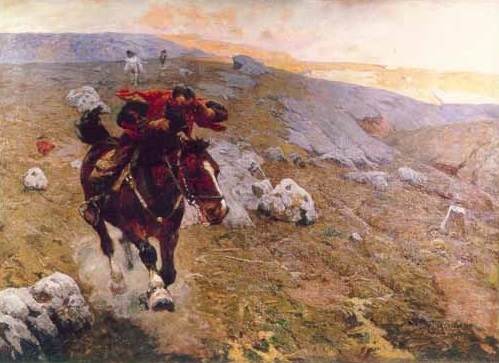 They were targeted as an easy scapegoat for the 1881 assassination of Alexander II, inciting several pogroms (mob violence) across the Podolia region. This violence, in addition to new economic restrictions enforced by the government, made life increasingly difficult. These factors inspired significant emigration, mostly to North America. Roubaud’s painting does not reflect such chaos and vulnerability, but a quiet existence. Jewish life in Russia is a multifaceted subject, and Roubaud’s window is but one view. The next few blog posts will further examine Jewish subjects in Russian art, as well as Russian Jewish artists. While this post explored Jewish subjects in ethnographic art, our next post will highlight Jewish subjects in Russian art by one of their own, the most famous Russian Jewish artist of the nineteenth century, Mark Antokolsky.